For this project I designed everything from the ground up. 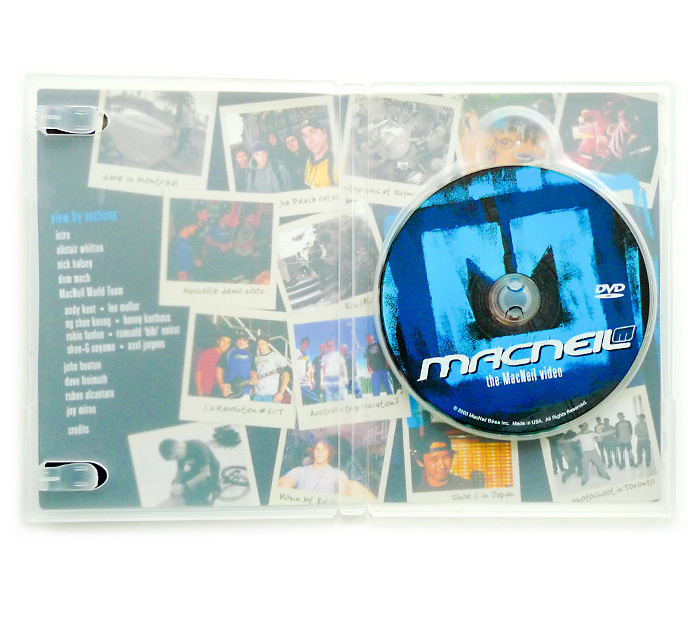 It was the first DVD I’d ever done, so there was lots to learn, particularly when it came to the DVD menus. Shown are the mocked-up dimensional cover, cover, back, and inside of the transparent jewel box, and just the wrap showing both with and without the DVD-Disc mocked into place. 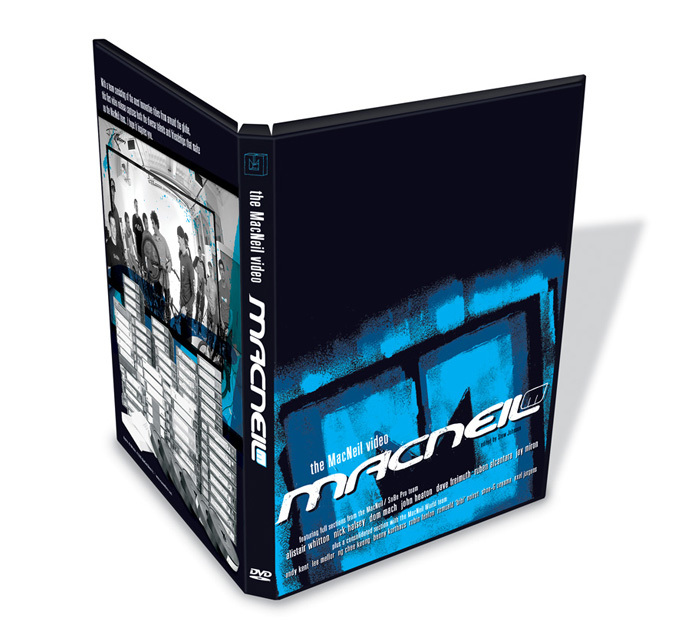 This was the first DVD in the industry to take advantage of translucent plastic jewel case, so it also features graphics and a breakdown of sections and team on the inside of the case. 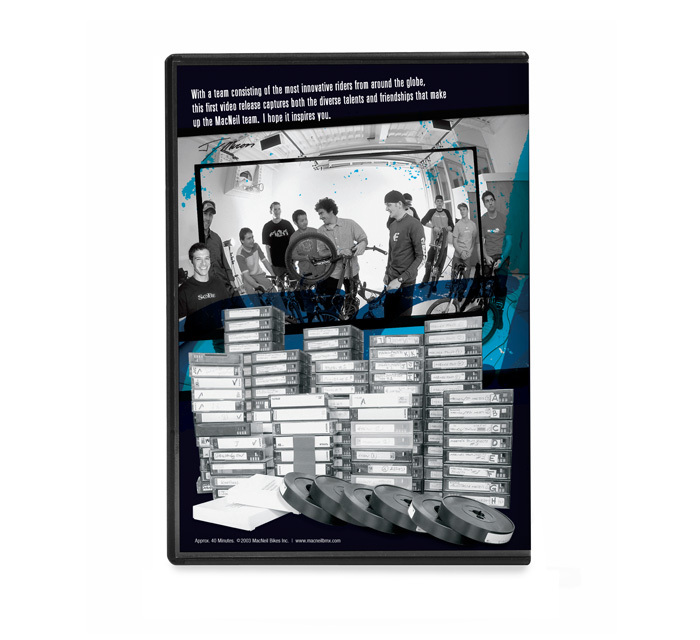 The back of the DVD case features a stack of mini-DV tapes and rolls of film which I composited to make it look like there was a bigger stack. Main navigation screen for the DVD menus. 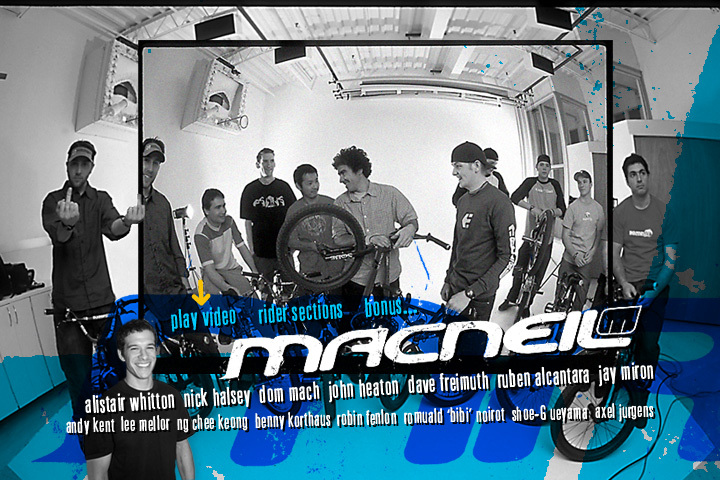 Featuring Full sections from the MacNeil/SoBe Pro Team: Alistair Whitton, Nick Halsey, Dom Mach, John Heaton, Dave Freimuth, Ruben Alcantara, and Jay Miron. 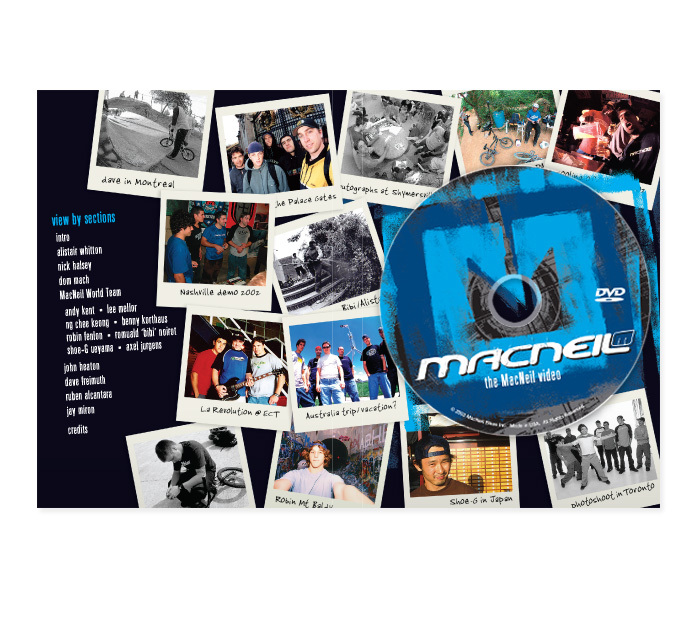 Plus, a consolidated section with the MacNeil World Team: Andy Kent, Lee Mellor, Ng Chee Kong, Benny Korthaus, Robin Fenlon, Romauld “Bibi” Noirot, Shoe-G Ueyama, and Axel Jurgens. 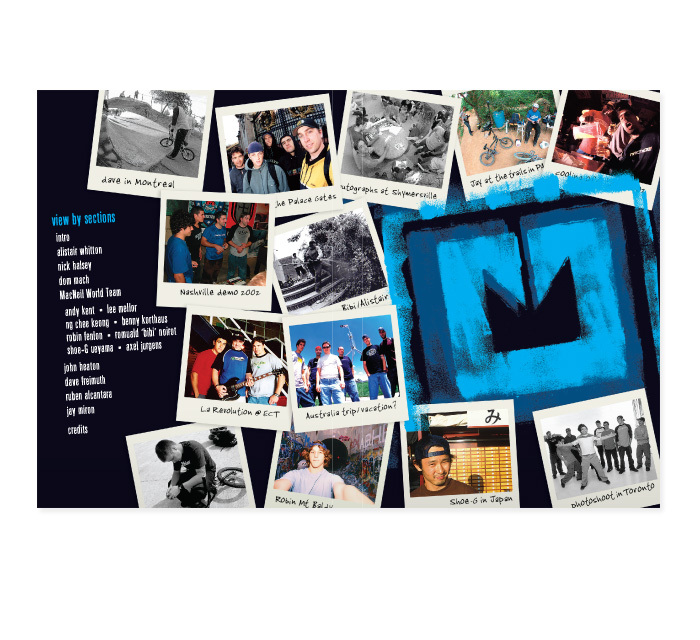 Edited by Stew Johnson, DVD menu production and DVD authoring by Joe Simon. 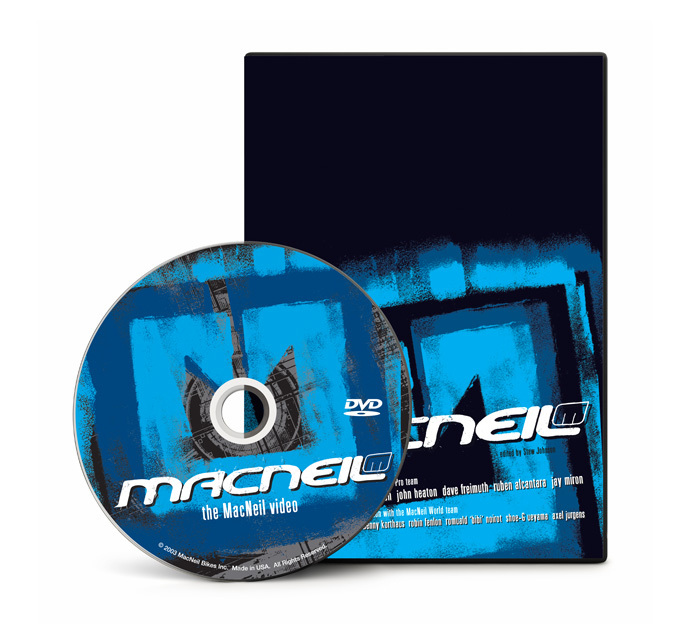 See also The MacNeil Video DVD menus, the MacNeil Bikes 2007 Catalogue and MacNeil Bikes ads.